← Are Adventure Sports Taken Seriously Enough? Surfing Etiquette – Are You in The Know? Surfing etiquette is a set of guidelines that all surfers follow in order to keep everyone in the water happy and more importantly safe. The rules below are not so much rules as common sense guidelines that all surfers learn and follow before they set foot in the surf. Surfers who neglect to follow surfing etiquette will soon wish they had when they find themselves blanked, sworn at, shouted at or just flat out beat up. So let’s take a look at what you need to do in order to be respectful on the waves. This rule is pretty simple – the surfers who are closest to the wave have the right of way. So basically if you and the surfer to the side of you are paddling to catch a wave, the surfer who starts off closest to the wave has the right of way and in order to follow surfing etiquette you should let them take the wave. 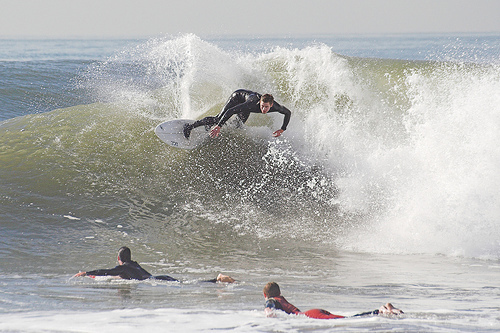 The only time this rule alters is if a wave comes up between two surfers – in this case each surfer has the right of way for their side of the wave. Why is this included in the surfing etiquette? Well as well as being respectful it also guarantees the safety of those in the surf. This rule coincides with rule #1 and is considered by surfers to be the most important guideline in the surfing etiquette handbook. Dropping in basically means “stealing” somebody else’s wave. This can either be due to them having the right of way (as described above) or due to them already riding it. Either way, don’t do it as not only will you piss the other surfers off you are making the wave dangerous for those who are riding it – not good! This surfing etiquette rule is pretty much common sense but it is still abused by some surfers. When paddling out don’t paddle in front of anyone who is already riding a wave (for obvious reasons) and where possible paddle through un-crowded areas where the waves aren’t breaking. Those riding waves have the right of way so if you find yourself directly in a surfer’s path it is your responsibility to get out of the way as fast as you can, whether this is by paddling or duck diving. This is an important part of the surfing etiquette – especially if you are surfing in a crowded area. We know this isn’t easy for beginners but you need to get out of the habit of throwing your board and diving under the surf only to recapture it again when you come back out. Surfboards are heavy and large and it goes without saying that leaving them to their own free will can cause injuries – sometimes serious ones. This is annoying in everyday life but even more so in surfing. If you are in a line-up to catch a wave don’t snake around surfers in order to cut your way to the front. Although it’s not dangerous as such it can be incredibly annoying and you won’t impress anyone. Wave hogs don’t get any respect at all in the water and if you cut the lineup you should expect the consequences. Additionally, just because the beach is your “local” beach, it still does not give you the right to wave hog. And the final surfing etiquette rule is to respect the beach. Don’t drop trash – it’s as simple as that. If you drop anything, pick it up and find a home for it. Much of the surfing etiquette listed above is common sense and by following it you will gain much more respect on the waves than you would otherwise. If you do make a mistake, give a quick apology and try your best not to do it again. Genuine mistakes are generally forgiven within the surfing community – those that continually disrespect other surfers and go out of their way to break the above rules won’t be so lucky. Laura is the owner of Extreme Sports X. When she is not scuba diving, she is blogging, gaming, or planning her next adventure holiday. This entry was posted in Surfing, Water Sports and tagged Surfing, Surfing Etiquette, Surfing Rules. Bookmark the permalink.